Want to add a note that I know this would not be practical in real life- but was a really fun concept to play with! Sketch and final sculpt in Oculus Medium, rendered with Cinema 4D Octane, and painted over in PS. Had a lot of fun with this one! 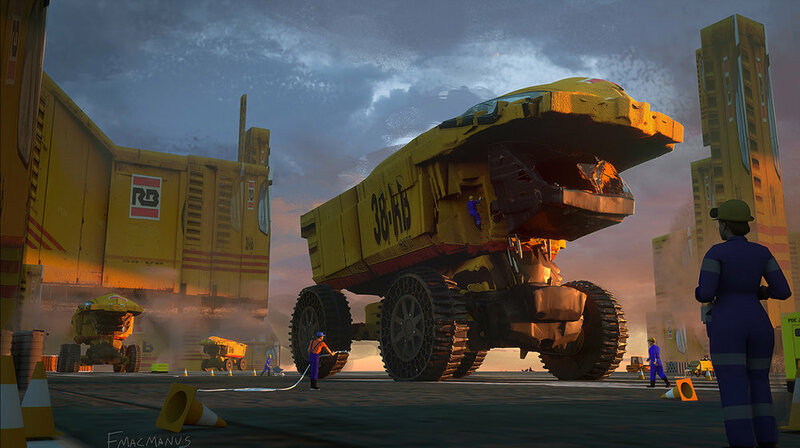 First keyframe for the inflatable dump truck, next one coming soon to show it's function when it's fully loaded! Was really fun to sculpt this.. Oculus Medium was used for most of the sculpting, then was taken into Cinema for final sculpt and rendered in Octane. Wheels done in 3D Coat, and a paintover in Photoshop. Many more vehicles in the works, hoping to share soon! Thanks to John Frye, Step Zavala and James Chung for advice during the conception phase. A take on a research vessel on a alien recently colonized world. The grasshopper is a durable and versatile research vehicle capable of surveying alien phenomena with efficient data gathering software. I put together some shots of the vehicle going through several landscapes on this planet. The base sculpt was created in Medium for the vehicle, architecture and landscape. Rendered in Octane and then painted over.